Photo 1: The proposed area for the new bed. 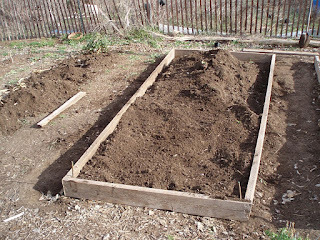 I've long wanted to build raised beds in my garden. 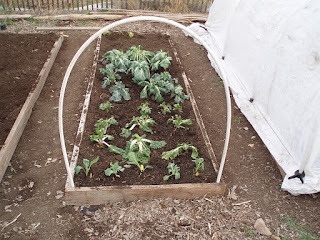 I've had wide rows for a while and while they are great and useful, they need more maintenance than real raised beds. 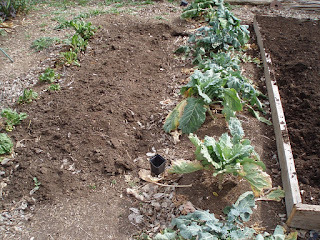 I've also been reading about and wanting to try no-till and other methods of gardening, like John Jeavons' biointensive system, and wide rows just don't lend themselves well to that. For those who don't know, wide rows are similar to traditional row gardening, BUT instead of being just a few inches wide at the top, they are a few feet wide. 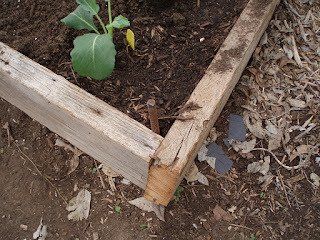 This increases the root space the plants in the row have and allows you to grow more vegetable plants in a smaller square footage overall. Having to water, amend, fertilize, mulch, and weed a smaller space is always great. What's also great is if don't have anything to build "walls" out of at the time, but still want to garden more efficiently than in traditional thin rows, you can. Another plus of wide rows is if you're not sure exactly where you want your beds to be at the moment, you can just take a shovel and change the configuration until you're happy with it. of the "box" being assembled. 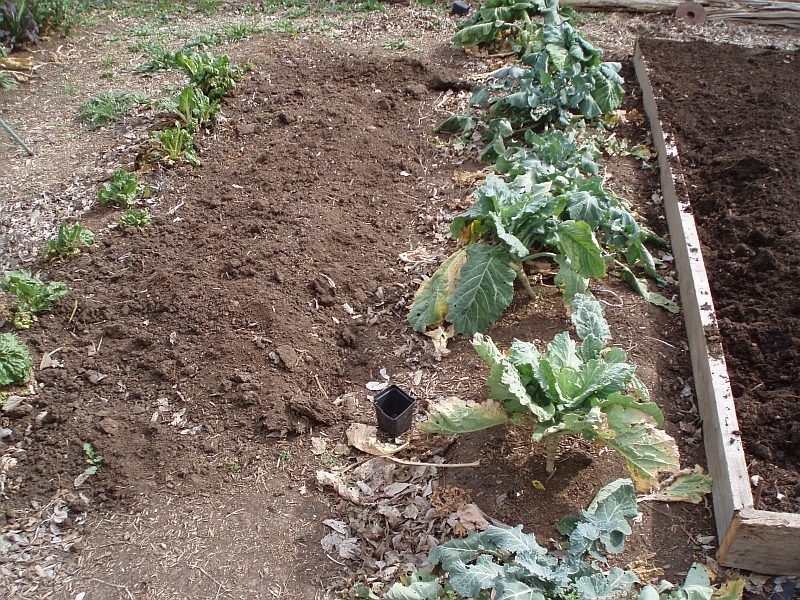 The main drawback is that they need to be pulled up on the sides by shoveling the soil back up there. As you water and rain falls and wind hits them, gravity takes over and the sides fall, making the bed eventually "melt" into flatness again. This also means the roots of the plants at the edges of the bed become exposed or are otherwise compromised because now that area, having less soil, dries out much quicker. This negatively affects the soil food web as well of course. Not good. Mulch helps lessen this "melting", but doesn't completely stop it. 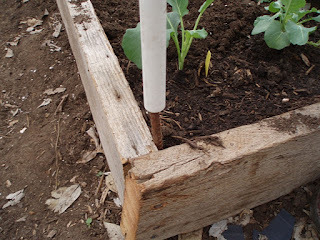 Another drawback to wide rows is, if you put rebar stakes in along the sides to hold pvc pipe frames for row cover or shade cloth, you'll likely have to remove the stakes each time you shovel up the sides, then install them again. Ugh. with compost, and partially raked smooth. Real raised beds have sides. That's really the main thing that differentiates them from wide rows. The drawbacks are that you have to find something to line the sides with and actually install that something. This takes time, labor, and money. But I think it's a worthwhile investment. You can use plain old kiln dried yellow pine, the usual wood used for building frames of houses. Be sure it's kiln dried - non-kiln-dried is sprayed with a fungicide while it's drying. And also don't get "Yella Wood" - that's treated. You want just plain old SPF, Soft Pine Fir. It's cheap. And even though it's untreated, it lasts three or four years before the corners start to rot out. When that happens, you can just scab on some new corners (cut 2' long pieces of boards and nail/screw them together on the outside of each corner, in effect making new corners). Or you could use some of those metal corner braces lumber stores sell (ask where the joist hangers are and look on that aisle). Or, my personal fave, start collecting antique strap hinges used on barn doors and gates. Those are a foot or more long and look really cool on the corners. You can also use cedar boards. I'm not sure how much longer they'd last, but I'd think twice as long as yellow pine. The drawback there is they are pricey. You can save some of that money if you scrounge around for the materials. For low-cost or free lumber, check Craigslist, find pallets to break apart, or haunt local building sites and ask - just be careful to avoid treated wood. If your land is really rocky, use those rocks to your advantage and do slip-form sides or formal laid stone walls. I've used cedar posts for walls, too ~ currently along my asparagus patch. The ones that aren't straight enough for fence posts look great once laid down carefully and with some thought to where the curves are. raking the soil down smooth. I've even seen people build raised beds from roofing sheet metal and used tires, though I'm not sure about the safety of those tires re: leaching. If anyone does the research and finds out one way or the other if they're safe, let me know in the comments, would you? I'd be very interested to hear about it. Just make sure whatever you use isn't treated with something noxious. Old lumber that's painted could have lead in the paint and I'd think that surely would come off in the soil. The chemicals in treated lumber definitely do leach into your soil. This includes railroad ties. If the ties are old, they may be weathered to the point that not much of the creosote is left to leach, but I'd bet there's still enough left in there to do some harm. Plus, from what I understand, railroad companies regularly spray their right-of-ways (including those ties I'd bet) with brush killer and that can't be good. I've used them before, old ones that were weathered and grey, but after reading up on them, I got rid of them. in the middle of a side. Regardless of what you use for the sides, the pluses of having raised beds are SO worth it. 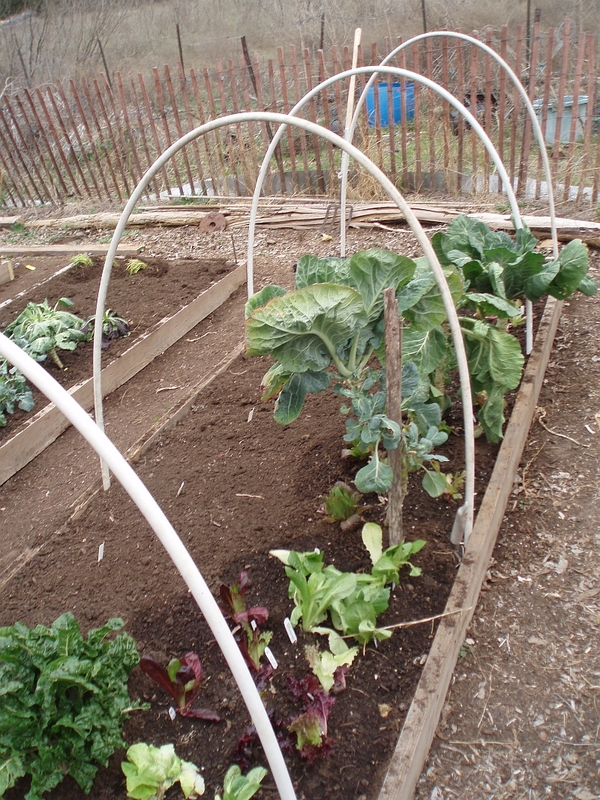 You don't have to pull up the sides, you can install the stakes and pipe frames and leave them, the plants growing don't suffer from the gradual lessening of their root space, and all your soil that you've built up and enriched over time stays put, right there in the bed. Marvelous! So the decision was obvious. And long overdue. I found some wood in one of the barns some time back. 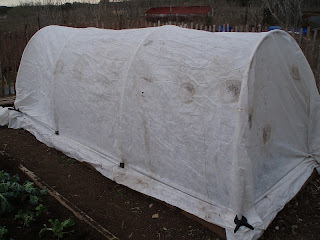 Some of it might be good for building projects like the lean-to greenhouse I want on the side of the garden shed, but most of it really isn't. Some is starting to rot from having been laying on the ground for a while, some has got deep chew marks on it from some varmint or horse, and some is off-sized. But it's all still got some strength left in it, plenty enough strength for raised beds. Photo 6: Installing rebar stakes for pvc row cover frame. Last week, we drug up some of the boards and got started. We did so well on the first one, that we kept going and got a second one done! This week, last Tuesday, we built two more. Of course I can't plant everything I want to just yet since I need the wide rows empty so I can reconfigure them into the raised beds. I'll have to forego planting as many onions as I want since I don't have that much space in the completed raised beds, and I skipped garlic this year for the same reason. But it'll be worth it. So very worth it. saw: a circular saw is much easier, but even a hand saw would work, OR ask the lumberyard to cut one of the 8' boards in half. They'll usually do one cut for free. piece of pvc pipe for the row cover frame. 1. Loosen the soil as deeply as you can with a shovel, removing all the weeds while you're at it. If you have bermuda grass or some other invasive weed, be extra vigilant in getting all the pieces. Do this in an area wider than the bed you want to build. 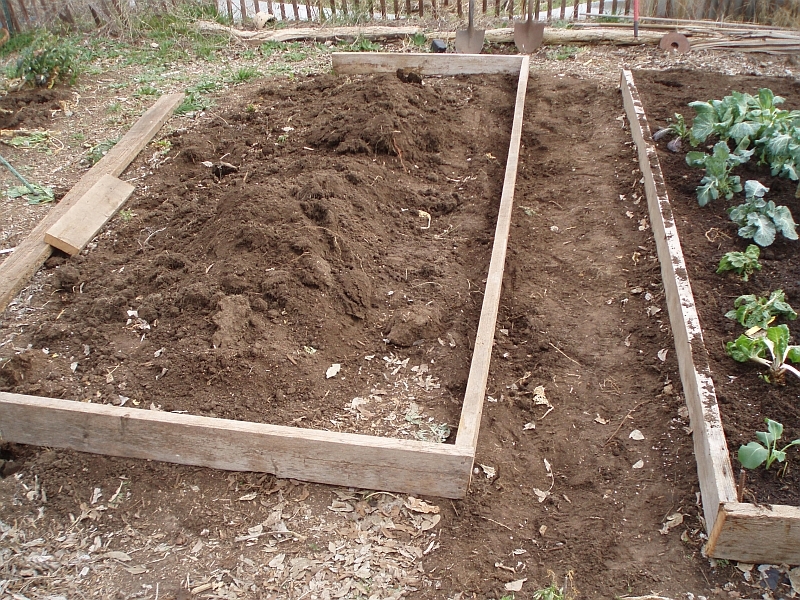 You'll be shoveling some of that soil from the walkways around the bed into the bed itself to fill it. How much farther out you loosen will really depend on how tall your finished beds will be. If your beds will only be six inches tall, you won't need that much extra soil to fill them, so won't need to go too far out to get enough. 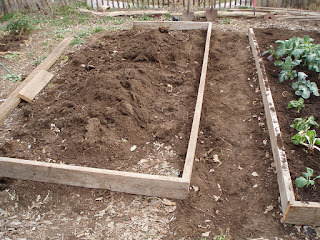 Loosening an area three feet out and just a couple inches deep should give you plenty of extra soil to fill a six inch deep bed, and maybe even an eight inch deep one, especially if you add a lot of compost. Digging shallowly farther out is better than digging deeper closer in. If you dig deeper down, but only a foot or so out from the bed, you'll have a big trench around it that would hold water when it rains, won't look all that great, and would be a bear to work in and around. Photo 8: Installing pvc pipe frame onto rebar stakes. Digging further out more shallowly, even if that means going a good bit out to gather enough soil, will lessen the amount of slope from the undisturbed ground outside the veggie garden area to the veggie garden itself, making the transition easier to navigate and more pleasing to the eye. You can simply fill in that lower area with mulch to lessen the slope even more, or completely get rid of it. And that mulch would make for no muddy walkways. Bonus! Plus, you will have an even wider wee-free area around your bed which will greatly lessen those aforementioned weeds getting into your newly made bed. Even better. In Photo 1, you see the area I chose for the next bed in my garden. Luckily the soil was already fairly loosened since I've been working it and amending it for a few years so it was easy digging. 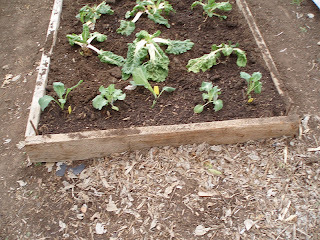 Unfortunately, there is a wide row with collards in it where the walkway should be. I had to transplant them into a finished bed and move all the soil in that row over a couple feet. Photo 9: First rib of frame completed. 2. Shovel the soil from the walkways around the bed into the bed itself. Mark out where you will put the sides of your bed and make sure the pile is well inside those lines to ensure the bottom of the wood sides are at the same level as your walkways. You can see where I did this in Photos 2, 3 and 4. 3. Cut the boards, lay them out on edge to form a box and nail them together around the pile of soil (see Photos 2, 3 and 4 again). If the boards you're using are long enough to span the entire length of the sides, that's great. But if they're not, you can still use them. In Photo 5, I show how to do this. Simply set your circular saw's base to a 45 degree angle and cut the ends of the boards to match each other, then nail them together at an angle. This is kind of tricky as you have to nail the nails angled so that the nail goes through one and into the other, but it's not that hard. You can do it! If your boards are one inch thick instead of two like mine, screwing them together may be easier. Be sure to flatten any portion of the nails or screws that sticks out into the soil so you don't injure yourself on them later if you dig in that area. 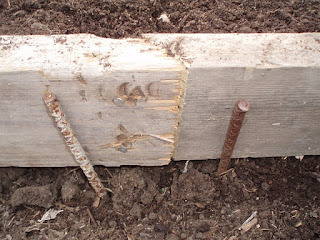 Then install rebar stakes on the outside of the bed on either side of the joint to keep it from bowing out. The weight of the soil in the bed, once raked down, will push out against the joint and keep it from bowing in. 4. Rake the soil pile down level. 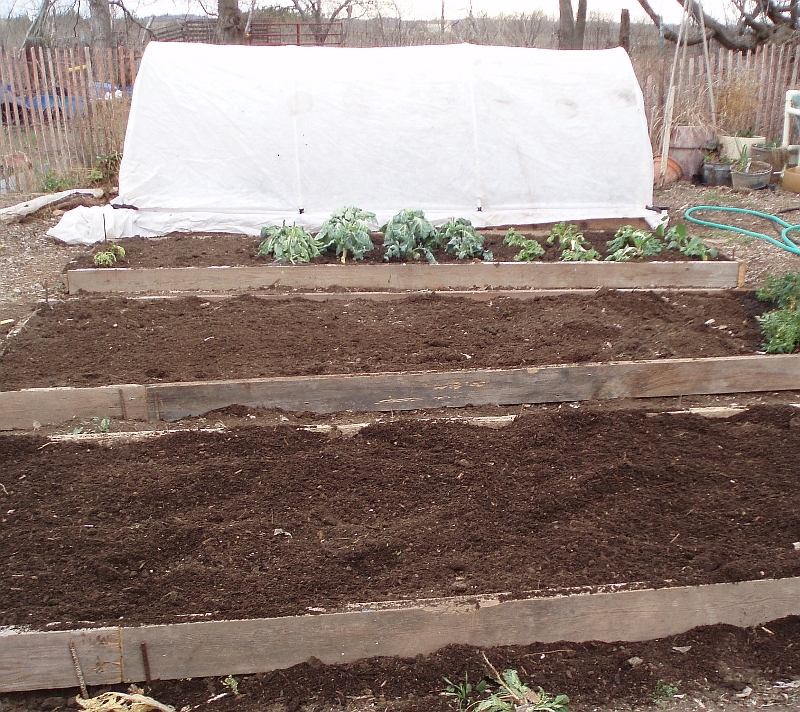 Add compost, mix it in well, and rake it down smooth again, as in Photo 3. An inch of compost is good, but more is better. Photo 10: All ribs of frame installed. 5. 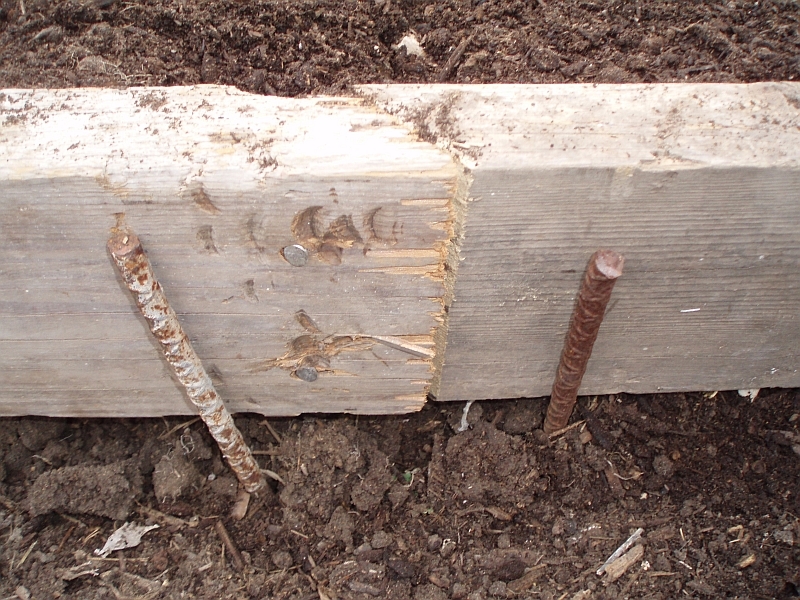 Install rebar stakes at all four corners (Photos 6 and 7). Just pound them in with a hammer. 3/8" thick 18" long rebar stakes are about about a buck fifty each at Lowe's. Ones 18" long will go at least nine inches into the soil below the box and still have three or so inches sticking up above the box for the pvc to easily slip over. I used some 18" long ones since I had them already, but when I bought more I got 24" long ones since they were only twenty or so cents more, but would go farther into the soil, making them even more sturdy. 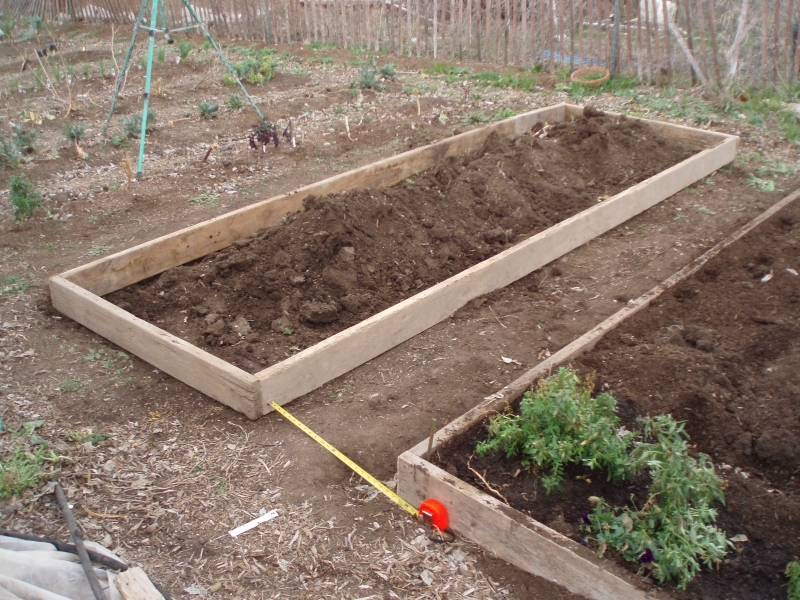 If your box is bigger than 4' x 4', you should put some stakes along the sides as well. My beds here are twelve feet long, so I installed them every four feet. If you want to install them closer together, that's great ~ the closer they are, the more ribs of your frame you will have, and the stronger the overall system will be once you cover it with the row cover. 6. Install the pvc pipe by simply slipping it over the rebar stakes, as in Photos 8, 9 and 10. I used 1/2-inch pvc, ten feet long. This gave me 4' tall frames, perfect for covering even the tallest broccoli plants and most snow/snap/shelling peas even when on a pea fence. 7. Cover the frame with floating row cover and clip into place (Photo 11). You can use any kind of clip so long as it's STRONG. I bought some of all the clips I found at Lowe's when I bought my stakes. You can see the black ones in some of the pictures. They're great for the corners as they can open up wide to grab a lot of bunched row cover in their "mouths". The bad part is they're kind of expensive at $14 for a set of twelve in various sizes, some of which I don't need. You may also be able to see the big binder clips along the sides of the covered beds in Photo 11. You can get them from an office supply store and they're fairly cheap. Drawbacks are they aren't as strong as other clips and they rust, but if you have a lot of beds to cover like me, they're a more economical alternative at least along the sides. So far, they've held in 15 mph winds (Update: The cover in these pictures held up in the wind storm we had where a 65mph gust was clocked in Burnet.). I don't think they'd work at the corners since they'd have to clamp over multiple layers of the row cover, but along the sides where they just have to clamp over one layer, they work great. I've also had people tell me they used three-inch sections of pvc pipe, the same size as the ribs, that they've cut along one side lengthwise. They just open the cut side enough to slip it over the pvc pipe rib, sandwiching the row cover in between. I haven't tried this yet, but plan to, and I hope it works as that would be OH so cheap. So there you have it! 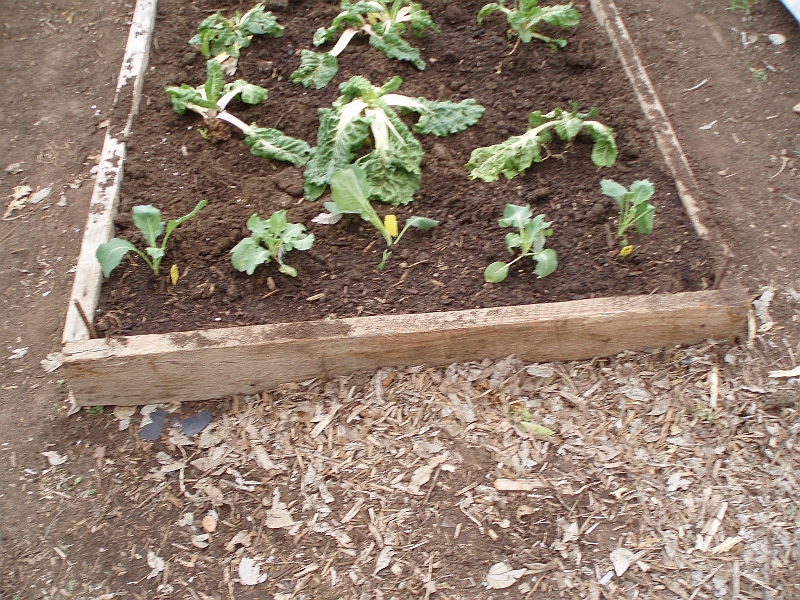 A raised bed, completed, and ready to be planted. Joy! Thank you so much for this post, it is inspiring and so helpful!! There is so much information out there on this but finally I found one that is easy and a good value for money! Will try this tomorrow for the rest of my garden! Thanks!!! You're so very welcome! It's not that hard if people just have the info. I have it and love to share it. That's why I work at the Natural Gardener Info Desk ~ so I can share. And I get as much as I give ~ did you see the post about the candles for extra heat under the row covers? That was a tip from a customer. A REALLLLLLY good one. I have eight beds done so far (pics in the March 21st post: http://www.theredneckhippie.com/2013/03/tomatoes-are-finally-all-in-ground.html )and room for four more. I can't wait 'til they're all done. It's SO much easier.